Now this is quick responding entrepreneurship. This is how you make money. Late last night, I posted the top search terms on Google and Yahoo, and already there's a new business up to capitalize on the opportunity presented by combining two of the hottest terms. Update: apparently the traffic has already eaten up the site's bandwidth. The iPhone is a big step forward for mobile marketing. If some early returns from Land Rover and 20th Century Fox are to be believed, Apple's iPhone will raise the stakes for marketers that go mobile. To be sure, the iPhone, with more than 1 million sold since its launch and working only on the AT&T network, holds a just fraction of the U.S.'s 250 million wireless subscribers. But results of iPhone-specific creative from both marketers indicate that the device's graphics and range of applications open up possibilities for marketers and their target audiences. Land Rover's iPhone-specific creative showed users the dealers closest to them. Land Rover, seeking new ways to reach its affluent target for the launch of its Range Rover Sport, ran a campaign on the iPhone that allowed consumers to quickly connect with the iPhone-exclusive Google Maps page providing directions to the nearest dealer or make a phone call there. We (at MyNuMo) believe that our iPhone games provide a superior channel to reach this demographic. We also have the capacity to quickly generate specific themed iPhone games and activities to meet the advertising needs of a brand looking to reach this desirable demographic. Please feel free to contact MyNumo for additional information. Today's WSJ reports that Wall Street expects the $215.99 iBucket to give this holiday shopping season a badly needed shot in the arm. With North American sales of the iBucket set to start the day after ThanksGiving, iPhone afficionadoes have already begun lining up outside of the still under-construction iBucket stores in New York, San Francisco, Los Angeles, Toronto, and Montreal in order to be the first to own the hot new iPhone accessory. In related news, Apple spokeswoman Gidget Gringle announced that Apple was set to introduce its own version of the iBucket in mid 2008. It will be called the iPail and is expected to retail for $400 to $500. "This will be the must have Christmas gift next year", she added. Apple shares instantly rose 15 points on the news. For most of us who started our business careers before the advent of the WWW, the dizzying rates of speed at which new industries emerge, peak, and then fade away is mind-boggling. The historical norm of industry arcs spanning 50 to 100 years or longer has been replaced by ones of typically 5 years. Does anyone recall the war of the giant search engines in the late 1990s? There was Lycos, Infoseek and about 4 or 5 others whose names I can't remember anymore vying with Yahoo and Google for dominance. Under the right conditions, the iPhone's ecosystem of third-party companies and software developers could equal the one surrounding Apple's iPod lineup of media players, [Jim] Sterling [of Sterling Marketing] believes. There's an estimated $1bn in sales annually of iPod add-ons. So it looks like investors, including those fickle venture capitalists, are salivating over this market which is great news for startups. Not only that, but we are starting to see mergers & acquisitions activity in the space. German software vendor, Shape Services GmbH, is acquiring New York City based iPhone Applications List. The company's founder was approached by multiple suitors before accepting the Shape Services offer. There's anecdotal evidence suggesting the investment community's interest in iPhone-related companies is relatively strong now. iPhone Application List founder Steve Schopp said Shape, based in Stuttgart, Germany, was one of three potential buyers that approached him. And as usual, we are seeing small players outshine the major players in terms of creativity and quality. Since a picture is worth a thousand words, let me illustrate this point with illustrations of iPhone Blackjack games from giant Yahoo and tiny MyNumo which appears to be emerging as the leader in iPhone games. So there you have you it, the trifecta of money-making opportunities: emerging technology, intense investor interest, and M&A activity. It doesn't get any better than that. Ladies & gentleman, start your engines! Every few years you stumble across a product that just makes you stop dead in your tracks and blurt out loud, "How on earth did I live this long without one?!" The amazing iBucket is one such product. This amazingly versatile device serves as a "platform" for your iPhone, PDA, MP3 player, Blackberry, and other electronic gadgets so that they may "rest" in one place while their batteries recharge. 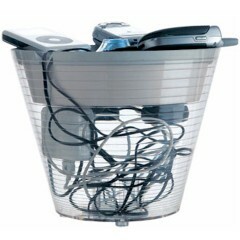 Just think, the days of searching for a flat surface to rest your gadgets on over-night are finally over! Suggested retail price for the iBucket is only $215.99, plus shipping and handling. Don't be surprised if Apple unveils its own version soon for double that price. After all, don't we need another reason to spend a cold rainy night lined up outside the Apple store? P.S. Word to the wise, spend the extra $75 for the easy-carry shoulder strap. If you have been waiting for a good reason to purchase an iPhone, this is it! Adobe releases Photoshop for the iPhone. Go play the latest iphone game Pigs a Pop'n. PIGS A POP’N: Sou-Wee!!! How ya gonna keep them down on the farm when they see this here new fancy puzzle game created just for the iPhone. Pigs need a feeding and you got only so much vittles to make them pop off the field. These pigs are a considerate bunch, so if you pop one he’ll kindly oblige you and pass some eats onto his neighbors. Do it right and you’ll set off one of them there “chain reactions” and clear that field off right quick. Clear one field and you can move right on to the next. 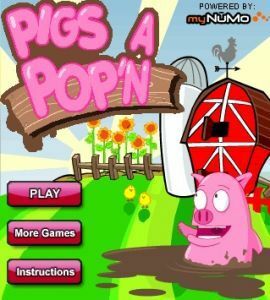 Takes real pig feeding skills to advance in this game, so get it done and play PIGS A POP’N on your iPhone today. Actually what happened is that plucky little games developer MyNumo launched a Paris Hilton game which then helped to jump-start a community and marketplace for mobile content publishers. Check out MyNumo's iPhone games. Check out the mobile content marketplace for publishers at MyNumo. This is creative entrepreneurship at its best. MyNuMo launches Fun4iPhone.com bringing games, social networking, news and cool products to the iPhone. Los Angeles, CA – July 2, 2007, MyNuMo today announced the launch of http://Fun4iPhone.com and the debut of its first iPhone game, iWhack. 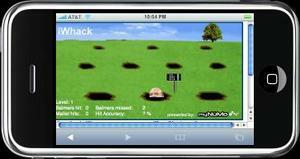 In the free humorous game iWhack, iPhone users get to “hammer home” the success of iPhone by whacking Steve Balmer (Microsoft CEO and iPhone critic) every time he pops up on the screen.